This webinar is sponsored by COMSOL and reflects their views, opinions, and insights. Attendance to this webinar is free. User interface for an app for modeling turbulent reacting flow in a water treatment reactor. The basin is designed to avoid short circuiting streams and for enhancing mixing within each compartment in the basin. This presentation focuses on the simulation of reacting flows. Reacting flow and fluid dynamics may heavily influence the residence time distribution of chemical species and the reaction distribution in a non-ideal reactor or reacting system. In this webinar, we will show how multiphysics modeling may be used to study and improve the properties and performance of such a system, as well as the process efficiency. The results of such simulations are often relevant to chemical engineering, fluid mechanics studies, process control, and mixer design. 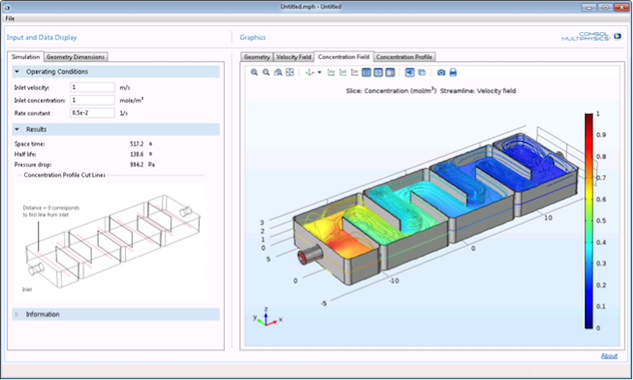 A live demonstration is performed in the COMSOL Multiphysics® software and is followed by a Q&A session at the end of the webinar.